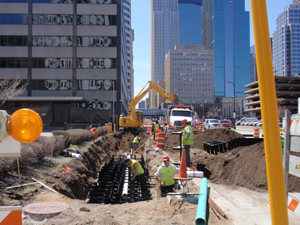 Like many older downtowns, Minneapolis utilizes a combined sewer overflow system to handle large storm events, discharging contaminated water directly into the Mississippi River when it exceeds capacity. To protect the river, the city requires landowners to disconnect all rain leaders from the sanitary sewer system and to explore every opportunity to slow the rate of runoff, reduce the total volume and improve water quality. It implemented a storm water utility fee to both incentivize and add consequences to this policy. Seeking solutions that would prevent the system from overflowing, project designers at Short Elliott Hendrickson Inc. (SEH) and URS Corp. chose the Silva Cell integrated tree and storm water management system as a natural fit to meet Minneapolis’ goals. The Marquette and 2nd Avenue (MARQ2) busway project covers 48 blocks of downtown Minneapolis in a mixed-use stretch that is a transit-way streetscape renovation. Some of the impervious sidewalks are being replaced with pervious pavement, allowing for infiltration and filtration of storm water within the integrated tree and storm water management system. The impervious catchment area for the MARQ2 installation is 6.6 acres, and water enters the new system through pervious pavers and tree-pit openings. Project engineers and landscape architects designed the streetscape to route storm water to the soil in the Silva Cells to eliminate an irrigation system and reduce runoff. Each group has perforated piping to convey excess water out of the system. This water is first filtered through aggregate and 3 ft to 4 ft of bioinfiltration media. Based on data values from research done by Prince George’s County, Md., the filtration offered by the soil within the cells will remove more than 80% of phosphorous, 60% total Kjeldahl nitrogen and more than 90% of heavy metals. The installation was accomplished without compromising existing urban infrastructure (e.g., utility lines). Eberhart was pleased with the outcome, noting this achievement. The streetscape design places each of the 179 trees in a Silva Cell group. Each tree holds 670 cu ft of bioretention mix soil and can store 134 cu ft of storm water. Over the entire project site, nearly 24,000 cu ft of storm water is stored in the cells’ soil. They are able to capture and treat up to the “P” storm, which is 90% of rain events. In Minneapolis, this event is less than or equal to 1.03 in. of precipitation in 24 hours. The project was installed from May through November 2009. It utilized more than 5,000 decks and 10,800 frames to help the trees reach mature growth and to fulfill storm water management goals. L. Peter MacDonagh, ASLA, ISA, CSLA, is director of science and design for The Kestrel Design Group. MacDonagh can be reached at [email protected]. Marcy Bean, RLA, is sustainable landscape architect for The Kestrel Design Group. Bean can be reached at [email protected].